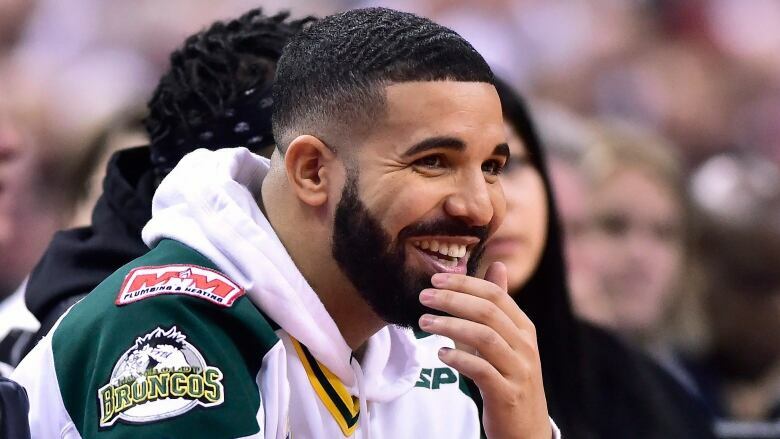 Drake showed his support for the Humboldt hockey community Saturday. The Toronto rapper wore a No. 14 white, green and gold Humboldt Broncos jersey to the Raptors' opening playoff game against the visiting Washington Wizards at the Air Canada Centre. Drake showed his support for the Humboldt hockey community Saturday. The Toronto rapper wore a No. 14 white, green and gold Humboldt Broncos jersey to the Raptors' opening playoff game against the visiting Washington Wizards at the Air Canada Centre. Drake, seated courtside, pointed to the sky when he was shown on the jumbotron, to warm ovation from the soldout ACC crowd. Sixteen people have died as a result of a crash last week when the Broncos' bus collided with a semi-truck just south of Nipawin, Sask. Another 13 people were injured.